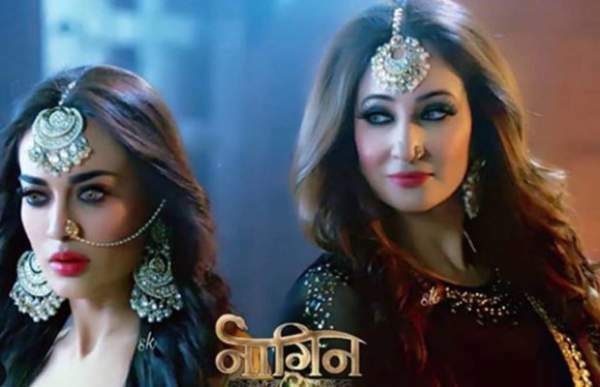 Naagin 3 written update of 9th February 2019 episode. The Nagin episode begins with Bela, Vish, and Vikrant asks for Naagmani from Sumitra. Bela says that their Naagmani is with Sumitra. Adi is running to find Sumitra and everyone. Adi reaches the place where Yuvi has been trapped with Rohini, Alek, the vulture and try to help them, but Mahir comes from behind and kicks him. Adi starts beating Mahir and Yuvi holds Kuhu. Bultu points on Adi and asks Yuvi to leave Kuhu. Alek says that kill Adi as they don’t have any problem. Yuvi asks to get out of the trap or else he will kill Kuhu. Sumitra says that she doesn’t have the Naagmani. Bela takes the key ring out from Sumitra. Sumitra says that Vish said that the Naagmani is in Haveli. Bela brings the Naagmani from Sumitra’s key ring and Sumitra is shocked to see this. Bela says that she is so stupid and can’t even find it in the mirror in front of her. Vikrant says that they’ve got what they need and now they will not leave Sumitra alive. Yuvi has escaped with his team and takes Mahir. Yuvi takes Mahir with him to bring out Sumitra from the Haveli. Adi and the vultures are there to trap Kuhu, Andy, and Bultu. Yuvi shouts to leave her mother to Bela or else he will not spare Mahir. Yuvi has hanged Mahir in front of the dense forest. Yuvi asks to leave Sumitra or else he will throw Mahir in the dense forest. Sumitra laughs and asks for the Naagmani. Sumitra says that Yuvi has the trump card and it all depends on Yuvi that he throws Mahir or not. Bela, Vikrant, and Vish come in their Naagin avatar and leaves. Bela comes with them to help Mahir. The vultures have blocked Bela’s way. Yuvi asks to give whatever Sumitra is asking for or else he would kill Mahir. Sumitra comes and asks for Naagmani. Mahir asks for help from Bela. Bela says Mahir that trust her and tell that he is happy or not. Mahir replies exactly the same which he used to call him before too. Bela runs with her team and kicks down Sumitra’s team. Bela is with Mahir and says that trust her. She asks him to look into her eyes and takes out the Naagmani and keeps it on his chest. Bela helps Mahir recall everything with the help of Naagmani and pushes him down the cliff. Sumitra and her team are feeling helpless. The vultures also couldn’t see him. Bela says that Mahir has gone very far and has reached to the safe place. Sumitra says that she will kill Bela but Bela says that if she kills her then how would she do business with Mahir in exchange of Naagmani. Sumitra leaves with her team to find the Naagmani. Andy and Kuhu comes and asks about Mahir. Vikrant says that Mahir is with Naagmani and so, he would be safe. Andy asks then how will he come back? Vish says that Mahir will be back and he will be fine. Bela says that we will have to get Mahir back as we can’t let him be there. Mahir falls in the jungle and recalls everything. He thinks that how can he be happy? He thinks Bela has done so much for him by risking her life. He turns around and there are snakes coming around him. The snakes come in human avatar and start harming Mahir and Mahir began to run. The snakes start following them. Vish is worried that they’ve sent Mahir to the Naag log and he doesn’t know about this. Vikrant says that it is the place where a human cannot stand. Bela says that Mahir recalls their code language too. Bela says that she has to safeguard Mahir’s family before going back to Mahir. Sumitra returns home with her team. Bela stops them at the entrance and asks them to find a new place. Kuhu and Bultu come there. Sumitra starts acting emotionally in front of Kuhu about Mahir to grab her attention. Andy asks Bultu to throw out Sumitra and her team. Sumitra and her team try to come in their Naagin avatar and Bela come in front of Andy, Kuhu, and Bultu. Bela says that she has made a safe line around the house and Sumitra can’t enter the house with her team without anyone’s permission. Bela goes out to help Mahir. Sumitra and her team are standing outside and are planning something bad about her. Vikrant and Vish are waiting for Bela. Guru Ji comes there and says that Ruhi should not come here and not even go to the Naag Log. Guru Ji says that it is worse than a human has been sent to the Naag log. Guru Ji says that it is our duty to protect the Naagmani and Bela have given it to a human which is not a good thing. Guru Ji that Bela has danger from the enemies in Naag log. Guru Ji says that he thinks that Bela has reached the Naag log and prays to Shiv God to help her. Bela land on the Naag log and feels that everything is weird over here. She gets surrounded by the snakes and the snakes are questioning about Bela. Bela thinks that something bad has happened over here. Bela runs from there in her Naagin avatar. Bela reaches ahead and is worried about the strange happening in the Naag log. Mahir running from the snakes. Bela is worried about Mahir and prays to God for his help. Mahir reaches a point where there is no way and he makes a jump over there. Mahir thinks that these snakes are following him since he has entered this Naag log. He takes out the Naagmani. Precap: Bela is happy to see Mahir in his normal condition. Bela confesses her love to Mahir and reveals her reality. Mahir is unconscious and Sumitra throws Vish also on the ground!